Released just as 2011 came to a close, Spider Jack brought some great physics to the world of Xbox Live gaming, along with a maddening, challenging, addictive little game that's kept me going as 2012 dawned. 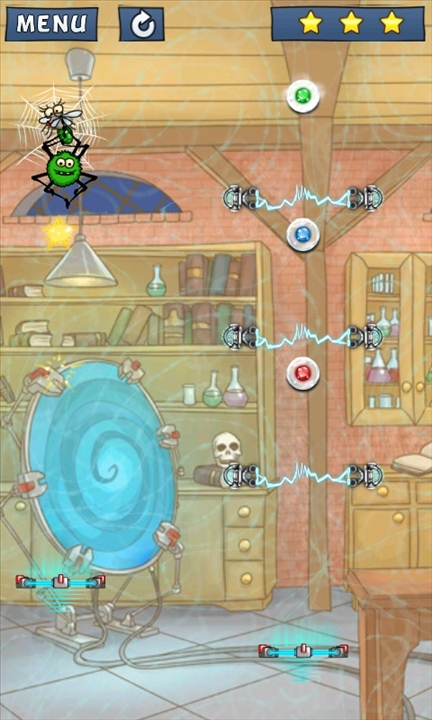 Even if it is a bit like Cut the Rope (and there's a reason for that), Spider Jack is a fine mix of the collecting and puzzling genres. 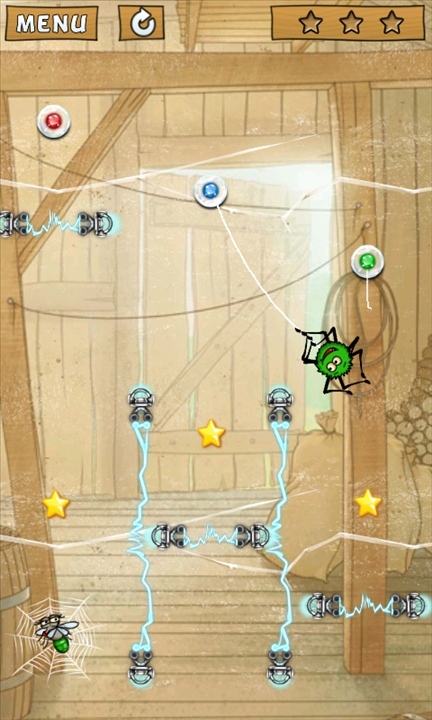 So, on that similarity point, Cut the Rope was published by Chillingo, who have worked with Microsoft Game Studio to bring Spider Jack to Xbox Live, so it's no wonder that I have a certain sense of déjà vu when playing the game. It's an interesting choice to bring a similar game mechanic to Windows Phone as an arguable hit on another platform. What's better - going for name recognition (Cut the Rope) with a side of yet another conversion, or potentially starting a new franchise name (Spider Jack) and hoping that people won't be too unsettled with the similarities? If people do come up against the naming problem, I hope they get past it quickly, because they'll find a game that, when written down, sounds like a headache of a Physics exam, but is actually pretty intuitive. 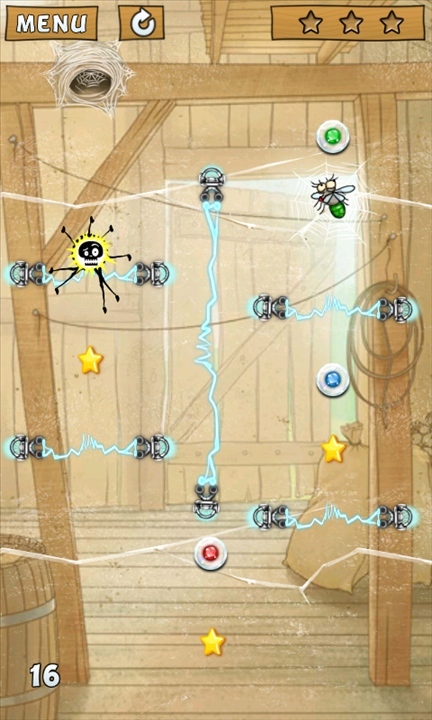 You play the titular arachnid, and you have three moves available to you: automatically climbing up your strand of web towards the point it is anchored; throwing out a strand of web to another of the anchor points on the screen; or cutting a strand of web that you are holding on to, allowing you to fall through the air. This allows you to create some wonderfully graceful swings, arcs and trajectories, and it's this that makes the game so intuitive. Even though you don't have to understand the maths, or the reasons why, I think almost everyone who plays the game will know exactly what sort of curved path Jack will take when you do one of the actions. There is a goal in all of this swinging around, and that is to get Jack to the other bit of fixed web on the screen, where lunch has been captured. Get Jack to the fly, and the level is complete, and you can move on to the next part of the house and try to reach another fly (he's a hungry creepy crawly). 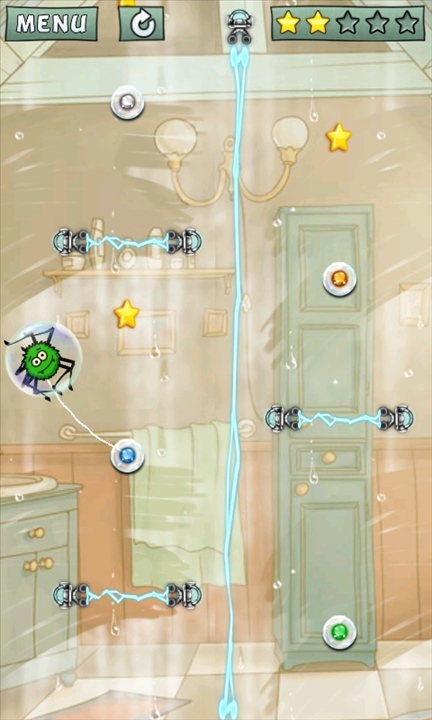 Being in a house, you'll have objects dotted around to help and hinder you - little soap bubbles you can climb into to lift you up the screen against gravity, hair dryers to blow you quickly to different parts of the screen, and electrical outlets creating lines of death that will kill you instantly. Along the way you can swing into bonus stars and grab them to improve your "grade" on finishing each level. Grab them all, and you get the now typical three stars of awards, moving down the scale to passing the level with no stars - you move on, but there's always be that gap, taunting you, on the level selection screen. I love that Spider Jack is a 'no pressure' game. By that I mean you can take as long as you want on each level, trying things out, perfecting ideas, and you'll never be thrown back to the start just because you have run out of some arbitrary time limit. Neither are you limited by a "three lives and start from level zero" approach. You can start at any level, and restart a level as many times as you like, be it through death, incompetence, or trying something else to get the final star. That makes Spider Jack very accessible and snack-like - it's very much a mobile game suited to playing in short bursts throughout the day. The concept of the game is already proven (and then some) on other platforms, so things like level design, physics and the actual UI are all of the best quality. If you insist on gunning for the best score on each level and collecting all the stars, it can be maddening to complete. The mortal game players can focus on getting the flys and moving through the levels, but I suspect they'll be grabbed by the alluring swinging of Spider Jack. This is a character and a game that draws you in to its web nicely, and it's a web that I was happy to be tangled up in.